I hope that you've had a fab week! Every birthday should include cupcakes and cocktails! My images have been coloured with my Promarkers and I have added a little sparkle with my Stickles. I opted for a zingy green and purple colour combo...I love these colours together, they always make me smile! For more inspiration for this week's challenge, pop by the My Time to Craft challenge blog and take a peek at all the gorgeous DT cards! Ooooh cupcakes...mmmm...yummy! 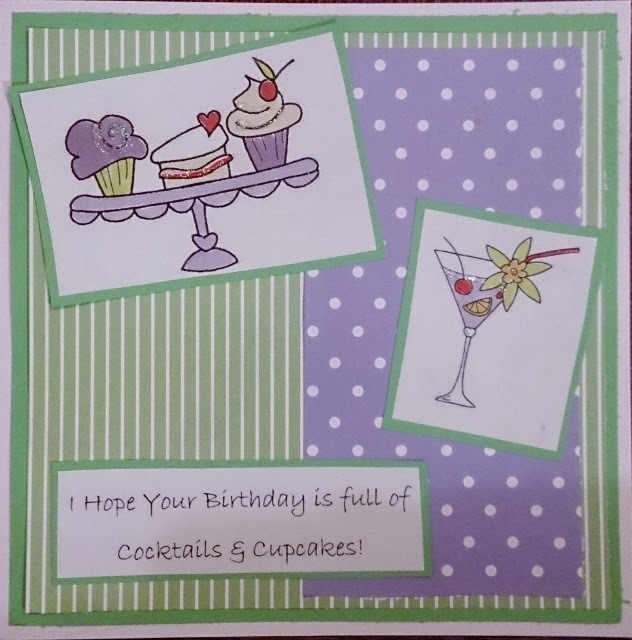 A fab card wedgie and gorgeous colours. Great card hun, love the colours you have used & yes that sentiment is perfect! Pretty card and what a great idea to incorporate these two images together. Lovely card! Thanks for the wonderful comment you left on my blog. Happy to have found a fellow baker as well as card maker!